To download the APP. Go to Google Play Store - Android and iTunes store for Apple. Search ‘Bible in One Year’ and look for the logo for the one you want. Select the name and download. 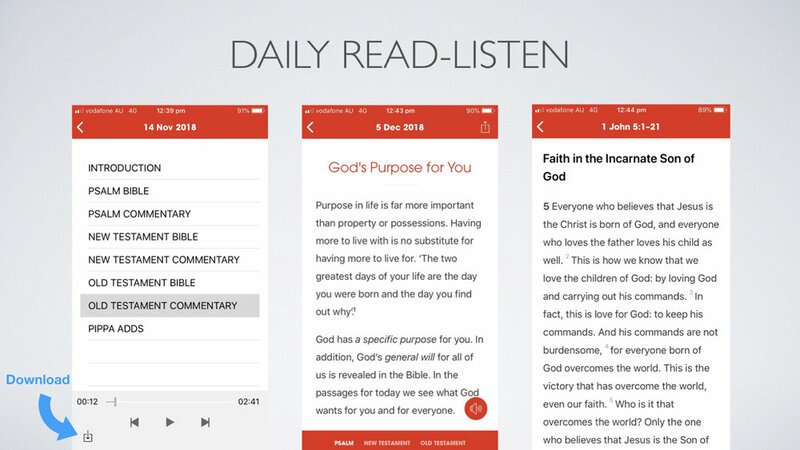 Open the App and explore Commentaries, go to Today’s date and scroll down the page for the daily reading. There is a listening feature for every section, so you can listen anywhere you have wifi. There is also a download feature, bottom left corner of your screen there’s a small arrow to download your files for the day.